Wedding Jewelry Bracelet Set. 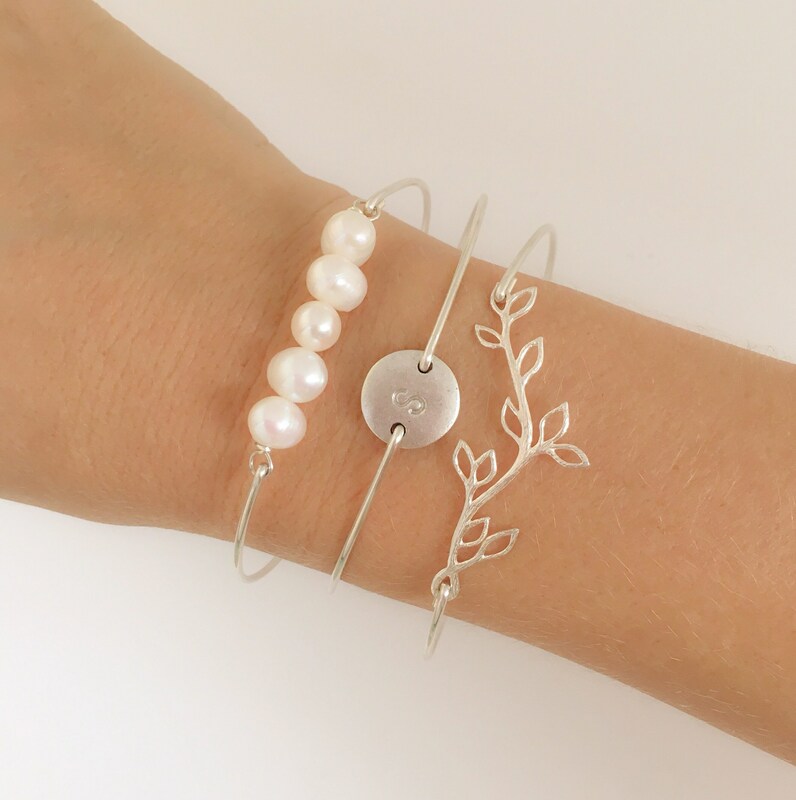 This is a dainty & delicate set of silver tones, cultured freshwater pearls, and an initial bracelet perfect for romantic & elegant wedding jewelry for bridesmaids, maid of honor, matron of honor, mother of the bride, and mother of the groom. 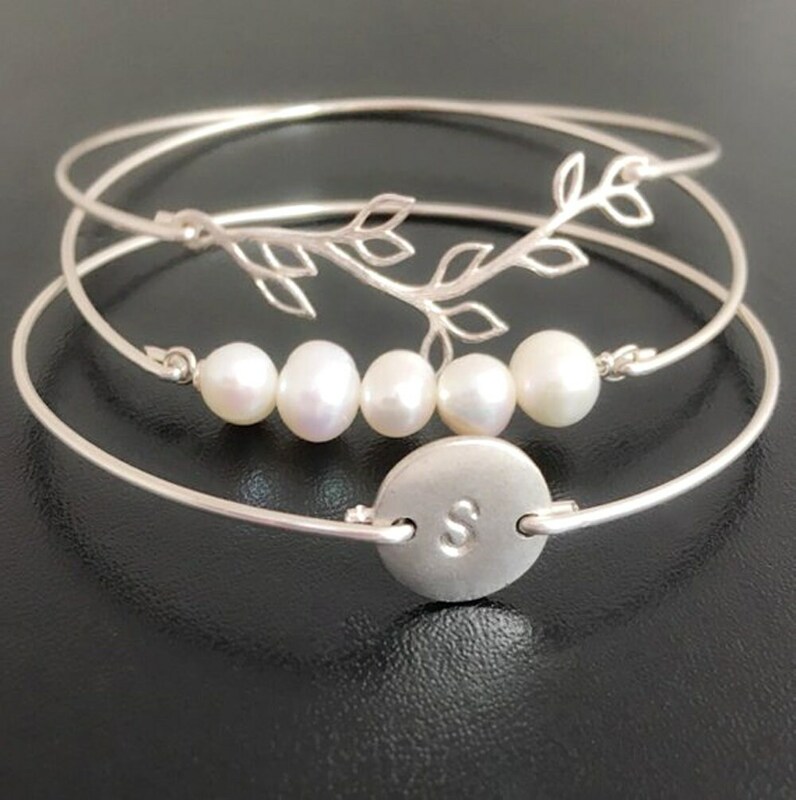 This bridal bracelet set includes a silver plated olive branch bangle, a bangle with a row of 5 white cultured freshwater pearls, and a personalized silver plated initial bangle. Each of these dainty bangle bracelets is paired with a silver filled bangle band. 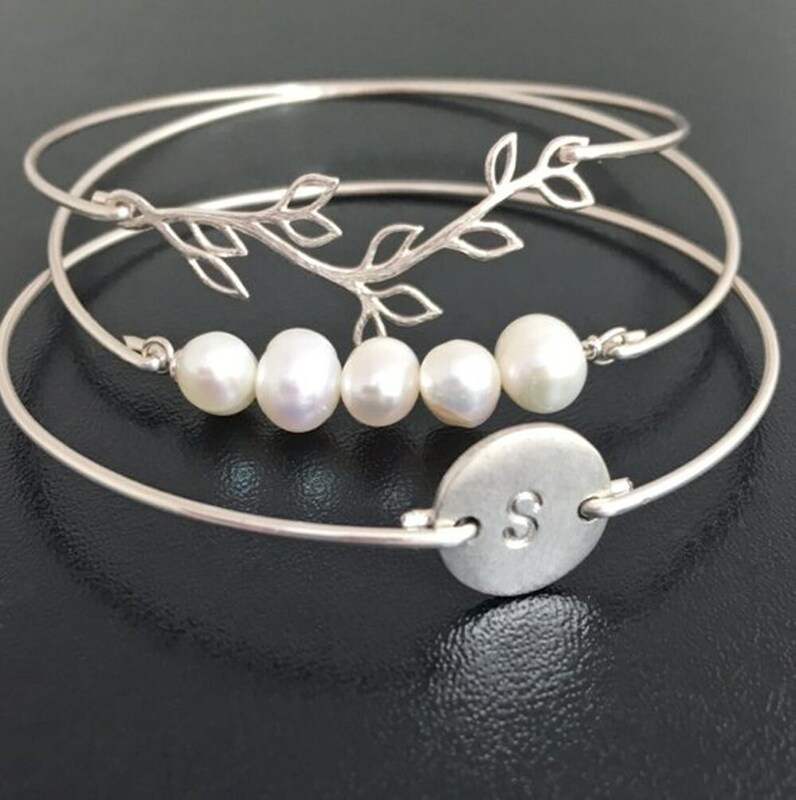 Sterling Silver bangle bands comes with a sterling silver olive branch and sterling silver initial disc. Brass bangle bands comes with a gold plated branch and a gold plated initial disc. 14k gold filled bangle bands comes with a gold plated olive branch and a 14k gold filled initial disc. 14k rose gold filled bangle bands comes with a rose gold plated olive branch and a 14k rose gold filled initial disc. Please put initial(s) in the notes to seller during checkout. For your bridesmaids you may purchase the olive branch bracelet as a stand alone bracelet if not wanting to order this full set for them. Please specify size in notes to seller during checkout for your dainty bracelet set. Choose from one of my regular sizes below. All of my bangles slide over the hand. They are clasp-free for easy on and off, and cannot be made to open. See easy pick sizes below. If unable to measure hand circumference for gifts, the descriptions are meant to be easy to select from. I can also add an extra half size to any set just to be safe (extra .25 inch). I can also come down by .25 inch or make in any custom size. This elegant & delicate wedding jewelry, delicate bracelet set created and hand crafted with great care and love. All of my bangle bracelets including this wedding bracelet bangle set are special handmade creations that are original Frosted Willow designs.